2200 Miles » Can you excuse my blog of its cobwebs? Can you excuse my blog of its cobwebs? Feed Bag: Oh, you know, gaining back all that weight I lost on the trail, grooming more regularly, and still traveling a lot. Feed Bag: Well, made it to my 48th state, Montana! Visited Glacier, Yellowstone, Grand Tetons, Wind Cave, and Theodore Roosevelt National Parks last fall. Biscayne Bay and Everglades National Park this spring. Feed Bag: I agree…but can we keep the name 2200miles.com? Thanks for coming back for a read. If it’s your first time here, welcome. 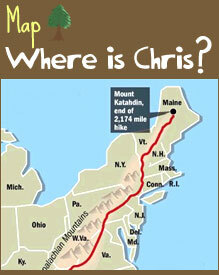 The blog was originally created to share my journey on the Appalachian Trail from March 29th to September 5th in 2009. Along the way I also compared life on the trail with that of people living in developing countries in which my organization works (World Vision). Things like…not having a faucet to turn on to wash your hands, sleeping without four walls around you, and vulnerability to all sorts of injuries and sicknesses. See all around this blog for more on that. That said, the I trust you’ll find the next few tidbits of information relevant and I’m excited to share them over the next few weeks. Interestingly, my last blog ended with “The next time you hear from me will either be a.) to announce my next adventure and invite you along or b.) to talk about how you can see “The Road Less Traveled,” the documentary I was filming for.” Pretty close. First, the AT Documentary I was filming for (Road Less Traveled) has been edited and completed in a 90-minute format! I’m actually getting to see it for the first time this evening at a screening in Reston, VA! While it may not be available for purchase soon, I’ll keep you posted if it gets picked up by any TV stations and other viewing opportunities. Next week I’ll blog my reaction to seeing myself and 5 other hikers on screen for an hour and a half. Look Ma, I’m on the TV! Second, I’m SO excited to announce that I’ll be taking my first overseas trip with World Vision to Tanzania one week from today! While there, myself and five other guests will be given tours of different areas where WV works, showing us communities where we’ve been for a while, as well as areas that still need our help. I really have no idea what to expect other than to be enlightened and changed. Lastly, what trip to Tanzania is complete without…a trek up Mount Kilimanjaro? I couldn’t resist staying an extra 8 days to get a view of Africa from its highest peak. While not a technical mountaineering experience requiring crampons, ice axes, and ropes, at 19,400 feet it remains snow-capped year round (on the equator) and presents an enormous challenge, not just in distance, but in altitude. I’ve never experience any height beyond what can be driven to in Estes Park, CO. So I’m anxious to see if I respond poorly, on par, or above average to the challenge of acclimatization. So, next Saturday I’ll board a plane for a very long time. But before then, I’ll blog again. And maybe, if we’re lucky, I’ll blog from Africa. Chris, we are so excited for what you are going to experience on your trip to Africa and we can’t wait to hear all about it and see lots of pics!!! Praying for you, friend! !